Description Alfred Jacob Miller was a prolific sketcher. He filled many journals with drawings and captions from the time he was studying in Paris and Rome (1833) until the 1870's. The varied interests of Miller are clearly reflected in these sketches: rural sites, studies after Old Master paintings, illustrations of literature, and comical scenes and characters. 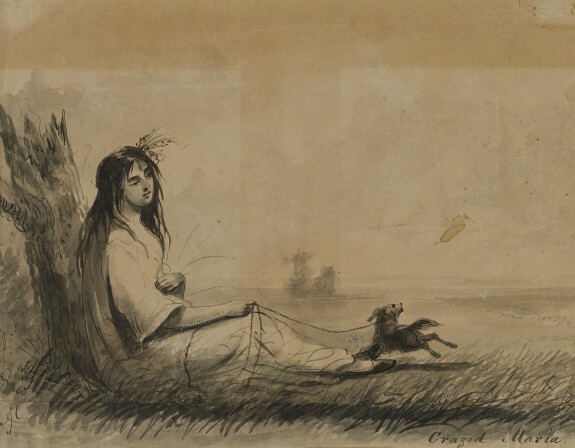 This sketch comes from the family album of L. Vernon Miller, which contains works that have passed down through the Miller family directly from the artist. Provenance Inherited by L. Vernon Miller, Baltimore ; inherited by Katherine B. Miller, Baltimore, 1965; given to Decatur Miller, Baltimore, 1982; given to Walters Art Museum, 1994.  passed directly from the artist down through his family.